On February 26, 2018, following the break-down of labor negotiations that have lasted for more than one year, members of the Graduate Employees’ Organization (GEO), Local 6300 IFT/AFT AFL-CIO at the University of Illinois in Urbana-Champaign (UIUC) went on strike. At the beginning of 2017, GEO drafted a platform for contract negotiations which emphasized the guarantee of tuition waivers for all graduate students, higher wages, less expensive health care, affordable and accessible childcare for parents, and legal support for international students. The current minimum annual salary for graduate workers at UIUC is $16,360 – nearly $6,000 less than the university’s own published cost of living ($22,314). Even less money makes it into the pockets of graduate workers each semester after paying $500 in university fees, $500 per dependant for health care, and sky-high childcare costs. Following contract negotiations which also ended in a GEO strike in 2009, tuition waivers became a guaranteed benefit for all graduate workers holding a 25% or greater appointment as a teaching or graduate assistant. These tuition waivers, which may account for over $13,000 per semester, are now under attack by the administration who have drafted paragraphs of language for the proposed new contract which give departments the “flexibility” to choose which students should receive this financial life-line. Furthermore, because graduate students must hold a tuition waiver to be considered part of GEO’s bargaining unit, this proposed change threatens the existence of the union itself. Formed in 2000, GEO represents roughly 2,700 graduate student workers and has a history of militancy, threatening to strike in 2002 over language defining its bargaining unit, successfully striking for two days in 2009 over the guarantee of tuition waivers, and now waging the longest strike in UIUC history (five days, as of March 2) to again guarantee tuition waivers for all. During the first week of the strike, GEO has focused their picket on the main quad, where the bulk of UIUC classes are taught, successfully emptying eight academic buildings. Members can be heard throughout the campus beating drums, playing brass instruments, and performing well-known labor chants and songs. Morale is high, members are militant, and solidarity is strong even after five days of relentless picketing. This strength and solidarity is on full display at the daily noon and 5pm rallies, which have brought out upwards of 1,000 people each time. 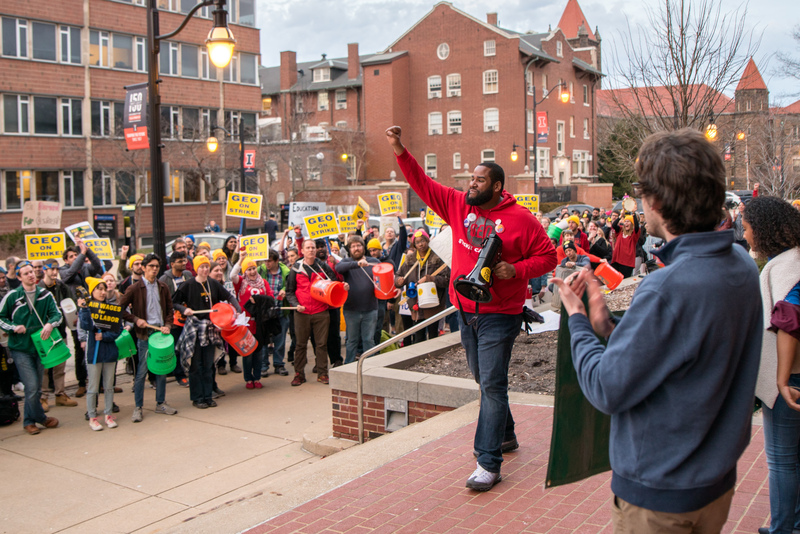 Speakers at these rallies continue to galvanize attendees, emphasizing the importance of this strike as a fight for the soul of public higher education. Members understand that the fight for guaranteed tuition waivers is not just meant for their immediate benefit, but to keep public higher education available to scholars of all backgrounds, regardless of socioeconomic status. Members have gained inspiration and motivation from the teachers’ strike in West Virginia and United Kingdom universities lecturers’ and staff strike – demonstrating the global impact of each of these struggles. GEO has wide support from students and faculty at UIUC with at least 25 departments publicly declaring their support. Members of Socialist Alternative, one of whom is a member of GEO, have joined GEO on the picket lines and rallies in solidarity. In addition to support from local unions (AFT, AFSCME and SEIU), GEO has also received support from unions and organizations both statewide and nationally. This struggle is part of a longterm neoliberal attack on working people. At the state level, the Illinois budget crisis and policies of staunch anti-labor governor Bruce Rauner have contributed to hard times for Illinois workers. All eyes are on the anti-labor Trump administration and the impending Supreme Court decision on Janus v. AFSCME, which threatens the existence of public sector unions. The outcome of GEO’s struggle will set a precedent not only for graduate students at UIUC, but for graduate students across the country. Right now, graduate students at the University of Chicago are fighting against their own administration and the anti-labor Trump administration for union recognition. GEO’s fight will also impact public sector unions more broadly. When coupled with strikes happening elsewhere, a picture is emerging that points of the potential to reignite the anti-Trump movement and foment a new mass labor movement. Faced with continuing attacks on education, health care, and wages, mass collective action by working people is the only way to victory for the working class. Continuing the struggle is the only way to fight back against the UIUC administration’s attacks. GEO members are committed to fighting until their demands are met. But to win their demands, GEO needs our mass community support. Come and join the picket line and rallies, donate to GEO’s strike fund, or bring water and supplies to those participating in the struggle. Socialist Alternative will continue to stand in solidarity with GEO!